In the beautiful town of Darlington, Impress Blinds offers beautiful and elegant Made to Measure Blinds that make your windows look great and function properly as preferred. Whether you want to enjoy a beautiful looking window design when blinds are shut on it or you need to enjoy that fresh breath of air with natural daylight springing all of your interior alight, Impress Blinds provides brilliant windows blinds that impress you with their design and boosted functionality. Our Cheap Windows Blinds are available in many different styles and materials providing privacy, daylight and fresh air control with beautiful color finish, all at the same time. 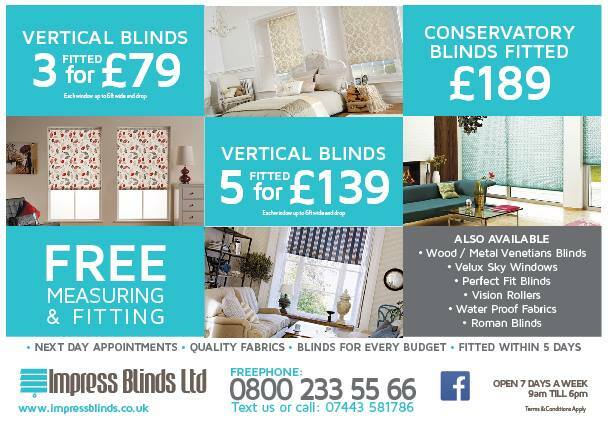 Impress Blinds offers a unique variety of Cheap Windows Blinds for our clients in Darlington. Whether you want the much beautiful yet affordable Cheap Roller Blinds that have a unique rolling mechanism covering or showing your windowpanes as preferred or you are after the fabric made Affordable Roman Blinds that fold on themselves piece by piece in a beautiful way, we have options for all kinds of printed designs. High quality Wooden Blinds, unique Vertical Blinds, day special Vision Blinds, cheap Metal Venetians, Velux & Shutter Blinds and also high material quality Conservatory Blinds are all our specialties. We specialize in making your windows look great with a complete design theme for all your interior rooms and halls in offices, commercial buildings or domestic households. Do you have irregular shaped or designed windows in Darlington and need windows blinds designed specifically for your windows? Impress Blinds provides high quality accurate Made to Measure blinds that can be made available in any custom measurements and designs required. We have our very own windows blinds designing facility that ensures all sizes and designs availability in Darlington with perfect fits for all your windows in every room. Whether you have a regular square or rectangle shaped window or any of your room has those curved or smaller windows, our made to measure blinds will fit them perfectly making the whole design look and feel organic. Impress Blinds in the Darlington region offers free windows measurements and installation services. If you are not handy with windows measuring, give us a call and we will send out an expert who will measure all your windows precisely ordering just the perfect cheap windows blinds for you. Once ready, we will come down to your house, commercial building or office building and install your windows blinds perfect ensuring every nail is in the right place and all hooks with opening and shutting mechanisms are working perfectly. These free services make windows blinds from Impress Blinds highest value for money in the UK market, you will not have to do anything on your own. When we leave, you will have a beautiful window covered with beautiful window blinds.